Sleeve notes in English, French and Finnish. Original French lyrics incuded with English translations. Excellent new Ondine release (...). Ondine's recording, engineered by Arnaud Houpert and Dennis Fenninger, is superb. Ondine new release includes works written in the last decade by one of the most important Finnish contemporary composers, Kaija Saariaho (b. 1958). Two of the works, the orchestral version of Quatre instants and Émilie Suite, feature the award-winning soprano Karen Vourc'h. Orchestre Philharmonique de Strasbourg is conducted by the orchestra's new Music Director, Marko Letonja. Émilie Suite is a 25-minute work based on Saariaho's 80-minute monodrama Opera Émilie. The Opera tells the dramatic story of a true historical character, Marquise Émilie du Châtelet (1706-1749), one of the earliest woman scientists, who was also a mathematician and a physician. The suite includes three songs and two orchestral interludes from the Opera. 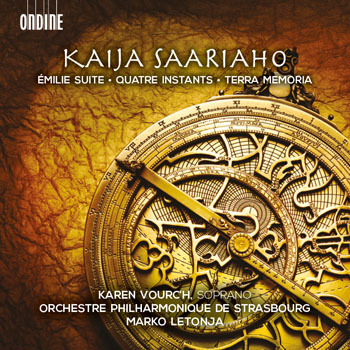 Quatre instants is one of Saariaho's vocal masterpieces, a song cycle in four movements, originally written for voice and piano, but soon adapted into an orchestral version by the composer. The songs which are based on texts written by Amin Maalouf for Kaija Saariaho reflect the various dimensions of love. Terra Memoria is a work for string orchestra, originally commissioned by the Emerson String Quartet. This meditative work is dedicated "for those departed".